MINNEAPOLIS, Sept. 21, 2018 /PRNewswire/ -- Uma Vempati, PE, PMP, ENV SP, recently received the George Warren Fuller Award from the American Water Works Association (AWWA) at the organization's Minnesota September 2018 conference in Duluth, Minnesota. Uma, Associate Principal and Water Solutions leader at ISG, joins the ranks of other notable American water solutions professionals who have been honored over the organization's 100+ year history. The annual award recognizes winners for "distinguished service in the water supply field and in commemoration of the sound engineering skill and the constructive leadership of a person in the Association," as described by the AWWA. Surrounded by drinking water related challenges in his native home in Southern India, Uma sought a career that encapsulated his childhood passion; to proactively address water related challenges and make a positive environmental impact. After earning his undergraduate civil engineering degree from Nagarjuna University in Andhra Pradesh, India, Uma moved with his family to the U.S. to pursue his Masters of Science in Civil Engineering from North Dakota State University; a University in which ISG has direct engagement with, supporting numerous recent alumns. Since joining the firm, Uma has served as an instrumental leader in building the firm's water solutions team, and empowering more than 100 engineers, operators, and designers. "Uma understands the importance and urgency of our planet's water challenges and seeks to solve those issues every day," applauds Chad Surprenant, PE, ISG President | CEO. "He's not one to boast or seek credit for his work – he merely views it as the right thing to do. However, that is what makes this award so fitting for Uma, a resolute and passionate water expert. Collectively, we are fortunate to have his dedication to this natural resource," notes Chad. Earlier this year, Uma presented at the AWWA's India Chapter Annual Conference in Mumbai, and has served on the Board of Directors of the Minnesota Chapter of the AWWA between 2014 and 2017. 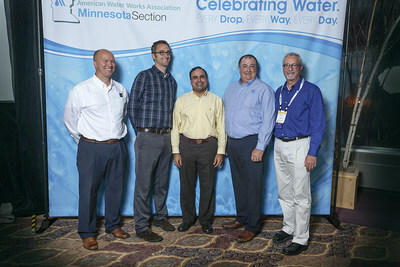 Uma was also awarded the 2016 Andrew Sullivan Outstanding Leadership Award from the Minnesota Chapter of AWWA, and currently serves as the Vice Chairman of AWWA's Diversity and Member Inclusion Committee (DMIC). He is a member of Water Environment Federation's (WEF) Small Community Systems Committee and an avid advocate of strategic and collaborative water resource management. "His volunteerism speaks for itself, as does his tireless leadership across the industry," says Andy Brandel, PE, Vice President and leader of ISG's Minneapolis office. "Working with Uma, I've had a chance to witness the immediate impact he has on cross-market projects, He offers unmatched mentorship and is an invaluable resource to our clients, firm, and region at large," states Andy. Uma is based out of ISG's Twin Cities location in Minneapolis, Minnesota. Additional insight into the next phase of ISG's partnership with the City of Eagle Grove, Iowa and Prestage Farms for a wastewater pre-treatment facility, one of the largest and most expedited projects of its kind led by Uma, is set to be released. Other news related to ISG's water solutions team includes recent water quality leadership, led by Staci Williams, ISG Water Quality Specialist and Grant Writer, who was featured as one of three local Iowa leaders labeled as the biggest supporters of the $117 million plan to create a network of water trails - an ISG project with the Des Moines Area MPO water trails group. If you missed ISG's recent Agricultural Drainage and Future of Water Quality Workshop held in Mankato, Minnesota, led by Chuck Brandel, PE, Vice President and Water Resources leader this past June, drone footage, videos, and presentations are available online here. To view AWWA's 100th anniversary video, that ISG and now employee-owner Dan Moen of Midwest Virtual Tours, created on behalf of the organization for the 2017 Annual Conference, please click here. ISG, a 100 percent ESOP firm, has a rich history, which extends over 45 years, of building trusting relationships with clients, stakeholders, and the community. As a full service architecture, engineering, environmental, and planning firm with 280+ professionals in offices throughout Iowa, Minnesota, Wisconsin, and South Dakota, ISG provides exceptional services, strategies, and guidance to a wide range of markets nationwide. ISG fosters strong collaboration between all firm disciplines providing clients a diverse knowledge base, high level of creativity, and broad perspective. ISG was named among the 100 fastest growing firms and best places to work for in the United States by Zweig Group, recognized as a Top 500 Design Firm by Engineering News-Record (ENR) magazine, named to the coveted PSMJ Circle of Excellence, and earned spots on numerous Top Workplace lists. Recent expansions include the organic start-up of a Sioux Falls, South Dakota location, acquisition of StruXture Architects and VGI Design in Iowa, and future Winter 2019 office relocation in Green Bay, Wisconsin. The firm is also celebrating its 45th anniversary throughout 2018. To learn more about ISG, visit www.is-grp.com.